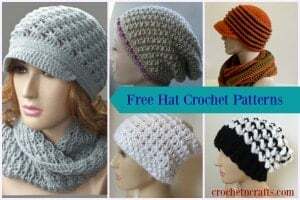 You will find that this easy crochet hat pattern is not only easy to whip up, but it’s also super easy to adjust in size from baby to adult. Plus, it features a pretty and textured stitch pattern that you’ll enjoy wearing. As for the pom pom, it’s optional but adds a lovely touch. I used Patons Canadiana for this pattern. It is a soft yarn to give a nice comfortable stretch. You can choose any yarn and hook that you have on hand. If you’re looking to complete an entire set, you might wish to check out this easy crochet cowl and this ear warmer. The hat is started at the bottom along the ribbing, which is worked in rows. You can increase or decrease the width but starting off with more or less chains. Then continue to work the ribbing rows until it fits around comfortably around the head. Once the ribbing rows are joined you begin to crochet along one edge in rounds until you reach a desired height. Gauge: 14 sts = 4″. Finished Size: Laying flat it measures 8.5″ across by 9″ high. Work instructions within parenthesis into one stitch as directed. Rows 2-60: Ch 1, blsc in each sc across. Turn. [10 sts] Continue this row until you have reached a desired circumference making sure to end in an even number of rows. Rnds 5-8: Rep Rnd 4. Rnds 12-16: Rep Rnd 4 with CB. Rnd 17: Rep Rnd 9 with CA. Rnd 18: Rep Rnd 10 with CA. Rnd 19: Rep Rnd 11 with CA. Rnds 20-24: Rep Rnd 4 with CB. Rnd 25: Rep Rnd 9 with CA. Rnd 26: Rep Rnd 10 with CA. Rnd 27: Rep Rnd 11 with CA. Rnd 28: Rep Rnd 4 with CB. Fasten Off leaving a 10″ tail. Weave tail end through last round made and pull tight. Weave in to secure. Attach a pom pom at the top. 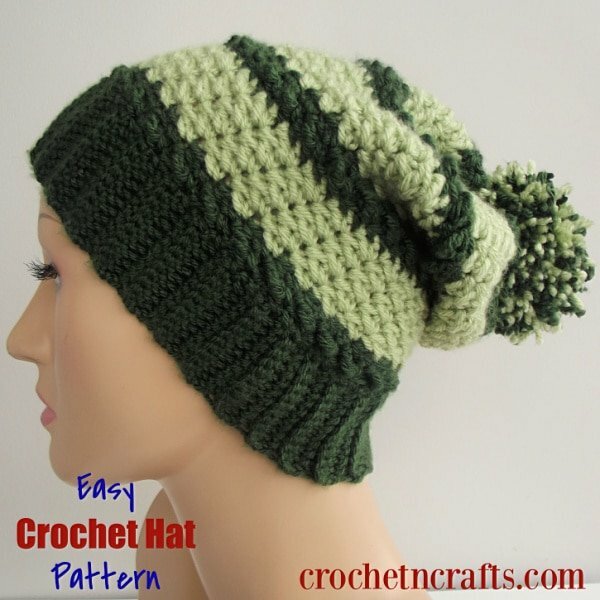 Use one or both colors of the yarn used to make the hat. Here is a tutorial on how to make a pom pom. Here are the main archive pages for crochet hats and crochet cowls.